Wendy, I know you meant “fight” but I think “fright” fits just as well. We are all frightened to death of what the future holds for us as long as this austerity nonsense continues. If you can’t get there in person, you can still join online at this link. Don’t miss the comments about ATOS and lets flood them with our own! It’s up to every one of us to make our voices heard anywhere and everywhere we can especially now while so many others of all walks of life are pushing back too. If you use facebook or twitter, use those to get it out there as far as possible. (I am not a big user myself, I only have 12 friends on there lol, but I did that because you never know which of your friends have hundreds and will pass it to all theirs! Lets tell this government in our hundreds of thousands (if not millions!) that we the people mean business and we’re not going to take one more minute of this austerity charade. And it IS a charade. There is plenty in the coffers, they are just giving it away to their own cronies – the already wealthy! DON’T GIVE UP – THE TIDE IS TURNING!!! 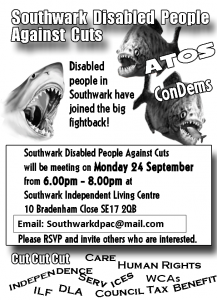 Hi would have liked to attend tonight as I am also sick to death of Atos and what they do I have had an awful time pease let me know when next meet is and will come.